Medical therapy has limited usefulness in treating prominent lips but can help alleviate the underlying cause or associated anomalies. Steroid therapy, antibiotics, salazosulfapyridine, and radiation have shown limited success. Establish a balance between upper and lower lip tailored to the individual patient. Obtain optimal frontal rather than profile aesthetics. Design of the wedge-shaped excision. Lateral extensions are necessary to eliminate dog ears. The goal should be removal of hypertrophied labial glands, fibrosis from an infiltrative process, or generalized thickened redundant tissue. In the upper lip, macrocheilia usually affects the lip in the vertical dimension. If the dry vermilion is not excessively large, the reduction surgery is designed as a transverse ellipse behind the wet line. However, if the entire vermilion is enlarged, then design of the excision may include the dry vermilion. With the patient upright, the amount of excision is estimated by pinching the mucosa until the desired vermilion show is obtained. The wedge-shaped excision removes mucosa, submucosa, submucosal glandular tissue, and occasionally, orbicularis muscle. The incision lines should be wavy, and the design of the excision should not compromise the oral circumflex artery. Therefore, the outer incision should be at least 5 mm above the inner lip angle. The future scar should be inconspicuous. The amount of excised tissue and the grade of planned inversion are determined individually for each case. A useful technique of lip wedge excision is to first clamp down the amount to be excised with either a side cutting bone cutter or a Satinsky vascular clamp for approximately 5 minutes. A. Intraoperative view demonstrating clamping down on the vermilion with a side cutting bone cutter. 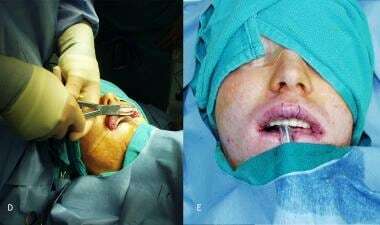 B. Intraoperative result. A key upper lip feature, the central tubercle, must be preserved or recreated. A transverse excess of the upper lip is more difficult to address, mainly because this requires excision of a vertical segment of tissue that leaves visible scars on the lip. Therefore, some transverse excess is tolerated. If the transverse lip dimension is excessive, a bilateral cleft lip repair can be designed to hide the scars in the philtral columns. This is rarely necessary. For the lower lip, the vertical and transverse dimensions are assessed. If vertical excess is the main concern, then transverse wedge excision is performed, keeping in mind that the lower lip vermilion is slightly fuller than the upper lip and is slightly posterior to the upper lip. When a floppy, redundant lower lip is encountered, usually transverse lip excess, exaggerated lip eversion, and deficient muscular tone are present. In this instance, a vertical wedge excision of the lower lip is helpful to decrease the transverse redundancy and reestablish the structural sling of the lower lip sphincter. The incision should not extend beyond the labiomental fold. Instead, the design of the incision extends horizontally to hide the scar along the labiomental groove (see the image below). The vertical excision may be combined with the transverse wedge excision in the mucosa to obtain an optimum result. A. Child (age 6 years) with cerebral palsy who has hypotonic upper and lower lips presents with lip incompetence and uncontrollable drool. B. Design of the lower lip full-thickness excision. Complications include hypertrophic scarring, hyperesthesia, and asymmetry. [5, 6, 18] Mucocele formation is possible, in theory, but rarely seen. Niamtu J 3rd. Lip reduction surgery (reduction cheiloplasty). Facial Plast Surg Clin North Am. 2010 Feb. 18(1):79-97. [Medline]. Fanous N, Brousseau VJ, Yoskovitch A. The "bikini" lip reduction: an approach to oversized lips. Plast Reconstr Surg. 2008 Jul. 122(1):23e-25e. [Medline]. Sforza M, Andjelkov K, Zaccheddu R, et al. The "Brazilian" bikini-shaped lip-reduction technique: new developments in cheiloplasty. Aesthetic Plast Surg. 2012 Aug. 36(4):827-31. [Medline]. Martins WD, Westphalen FH, Sandrin R, et al. Congenital maxillary double lip: review of the literature and report of a case. J Can Dent Assoc. 2004 Jul-Aug. 70(7):466-8. [Medline]. Pitanguy I, Gonzalez R, Brentano J, et al. Surgical treatment of macrocheilia. Head Neck Surg. 1988 May-Jun. 10(5):309-18. [Medline]. Habel G, O'Regan B. Surgical management of macrocheilia of the lower lip. Br J Oral Maxillofac Surg. 1990 Oct. 28(5):295-8. [Medline]. Zide BM, Glat PM, Stile FL, et al. Vascular lip enlargement: Part I. Hemangiomas--tenets of therapy. Plast Reconstr Surg. 1997 Dec. 100(7):1664-73. [Medline]. Zide BM, Glat PM, Stile FL, et al. Vascular lip enlargement: Part II. Port-wine macrocheilia--tenets of therapy based on normative values. Plast Reconstr Surg. 1997 Dec. 100(7):1674-81. [Medline]. Cederna PS, Fiala TGS, Smith DJ Jr, et al. Melkersson-Rosenthal syndrome: reduction cheiloplasty utilizing a transmodiolar labial suspension suture. Aesthetic Plast Surg. 1998 Mar-Apr. 22(2):102-5. [Medline]. Liu R, Yu S. Melkersson-Rosenthal syndrome: a review of seven patients. J Clin Neurosci. 2013 Jul. 20(7):993-5. [Medline]. Hullah EA, Escudier MP. Update on Orofacial Granulomatosis. Prim Dent J. 2016 Feb 1. 5 (1):80-85. [Medline]. Gharbi A, Sonthalia S. Cheilitis Granulomatosa (Miescher Melkersson Rosenthal Syndrome). StatPearls. 2018 Jan. [Medline]. [Full Text]. Bartell HL, Harting M, Eldin KW, et al. Chronic, progressive enlargement of the lower lip in a healthy girl. Dermatol Online J. 2007 May 1. 13(2):20. [Medline]. Miest R, Bruce A, Rogers RS 3rd. Orofacial granulomatosis. Clin Dermatol. 2016 Jul-Aug. 34 (4):505-13. [Medline]. Ellis DA, Rubin AM, Shemen LJ. University of Toronto teaching rounds. Esthetic evaluation of the lips and cosmetic reconstructions. J Otolaryngol. 1982 Jun. 11(3):221-5. [Medline]. Farkas LG. Anthropometry of the Head and Face in Medicine. NY: Elsevier Science; 1981. Gunter PJ. Facial analysis for the rhinoplasty patient. Presented at: Dallas Rhinoplasty Symposium. 1999. 17-28. Epker BN, Wolford LM. Reduction cheiloplasty: its role in the correction of dentofacial deformities. J Maxillofac Surg. 1977 Jun. 5(2):134-41. [Medline]. Stucker FJ Jr. Profile contouring including cheiloplasty. Arch Otolaryngol. 1979 Nov. 105(11):680-3. [Medline]. Pensler JM, Mulliken JB. The cleft lip lower-lip deformity. Plast Reconstr Surg. 1988 Oct. 82(4):602-10. [Medline]. Rzany B, Becker-Wegerich P, Bachmann F, et al. Hyaluronidase in the correction of hyaluronic acid-based fillers: a review and a recommendation for use. J Cosmet Dermatol. 2009 Dec. 8(4):317-23. [Medline]. Vent J, Lefarth F, Massing T, et al. Do you know where your fillers go? An ultrastructural investigation of the lips. Clin Cosmet Investig Dermatol. 2014. 7:191-9. [Medline]. [Full Text]. Field LM. Macrocheiloplasty. Principles and techniques. J Dermatol Surg Oncol. 1992 Jun. 18(6):503-7. [Medline]. Matory EW. Lip thinning. E Courtiss, ed. Male Aesthetic Surgery. 2nd ed. St. Louis: Mosby; 1991. 180-1. Oliver DW, Scott MJ. Lip reduction cheiloplasty for Miescher's granulomatous macrocheilitis (Cheilitis granulomatosa) in childhood. Clin Exp Dermatol. 2002 Mar. 27(2):129-31. [Medline]. Puri N, Pradhan KL, Chandna A, et al. Biometric study of tooth size in normal, crowded, and spaced permanent dentitions. Am J Orthod Dentofacial Orthop. 2007 Sep. 132(3):279.e7-14. [Medline]. Frontal and profile view of a 45-year-old African American woman seeking reduction of her upper lip. Frontal and profile views 2 months postoperatively. Note the better result seen in frontal view compared to profile view. A. Face-on view of a 25-year-old male who sustained facial trauma 1 year ago. He presents with persistent upper lip enlargement after all other facial edema subsided. B. Pursing of lips shows exaggerated eversion. C. Profile view. A. 4 months postoperative view. B. Profile view. A. Female (age 13 years) with midface deficiency secondary to cleft lip and palate. The maxilla is hypoplastic and mandible is relatively prognathic with over closure. She has upper lip deficiency and lower lip prominence. B. After maxillary LeFort I advancement, the upper lip remains deficient and lower lip prominent. C. She underwent upper lip augmentation and lower lip reduction twice to achieve a harmonious facial profile. Lip reduction. Image from: Rees, T. Mentoplasty, prognathism and cheiloplasty. In Rees, Cosmetic Facial Surgery, 1st ed. Philadelphia, Pa: WB Saunders, 1973:550.